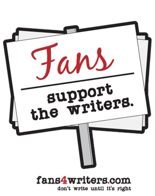 This site archives the Writers’ Strike Chronicles podcast and accompanying blog that served to give voice to the men and women on the picket line during the writers strike from November 4, 2007 to February 12, 2008. Both the blog and the podcast are retired from active postings. WSC Show #57 - Social Networking with Penelope Q.
Today’s episode features one of the newest members of the Writers’ Guild of America: 22 year-old Penelope Q. Recorded Thursday, 3 January 2008.Clip from Art Film Talk #23 Marshall Herskovitz, Quarterlife used with permission by David Tamés.As mentioned in this episode: "Viewing American class divisions through Facebook and MySpace" by Danah BoydCreditsProducer/Host: Tanja BarnesMusic: "Ay Mambo"